Are you looking to expand your professional network or keep your entrepreneurial spirit, personal development & business acumen sharp? Are you keen to contribute to a mission of promoting women's leadership and gender balance in the professional sphere? Is giving back to the community a priority for you and your organization? Promote your business or special activity by organising an OWIT Get Together, member-driven initiative for members and guests. Hold an event on the topic of your choice (in line with the OWIT mission) for your fellow association members and improve your visibility in the region. Volunteer with OWIT Lake Geneva to get a unique opportunity to develop your strengths, expand your network, gain more experience in a specific field and give back to the community of professional women. Join our Monthly Networking Meetings (MNMs), held in both Geneva and Lausanne. 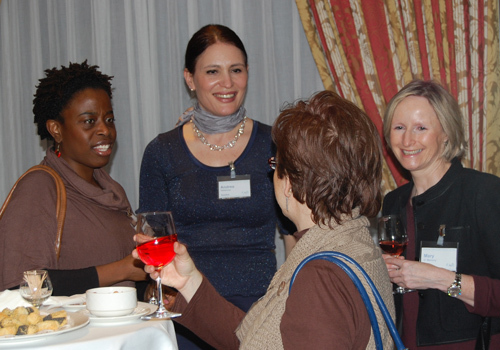 Meet old and new friends and connect with dynamic, professional and friendly women and men. Join our LinkedIn group to interact with fellow members around the topics that matter to you. Attend interesting speaker events organised regularly around the following themes: international trade & development, business development & entrepreneurship, personal & professional development and women’s empowerment. Have a voice in the decision making process of a dynamic, accessible and professional organisation. Being a part of OWIT Lake Geneva has benefited my personal and professional life. The opportunities I had [in OWIT] to organize and manage projects and to reach out and network with ease, with people who can easily be referred to as the "decision makers of the day" really helped me become fearless when it comes to creating the network and support I need to push forward a sustainability strategy in my company without having the budget to do so. Both the volunteer director role and the partnerships role (however brief it was) showed me the value of listening, anticipating and connecting the dots. I believe it is the vibrancy and richness of our members that make OWIT Lake Geneva what it is. As an independent business owner for the past 12 years, networking has been an extremely useful means to growing my business. OWIT is by far my favorite networking organization. Consistently, in the 5 years I have been a member, the events OWIT organizes are professionally stimulating and entertaining. While the people I have met are unpretentious and delightful! Being a member of OWIT Lake Geneva is for me a unique opportunity to meet fantastic women whom I would not have had the chance of meeting otherwise; women from diverse horizons, diverse nationalities, diverse professional backgrounds... a highly enriching personal experience! As I was in a transition stage between 2 jobs, I also became more involved by volunteering to some Marketing support work for the OWIT organization. This was not only great fun and interesting to find out from the inside how a non-profit organization is operating; but also made me feel good to be able to 'give back' to a community who is doing so much to support the advancement of women in business! You can count on me for remaining an OWIT member for many years to come! What I like about [OWIT Lake Geneva] is being part of a group of motivated, friendly people who freely share their skills, their knowledge, their hopes and their dreams. I have made many wonderful contacts and met many fascinating people whether through the casual after work cocktail hour or the more organised events. Having enthused about [OWIT Lake Geneva] to my friends and clients I also have the added pleasure of looking forward to meeting them there.